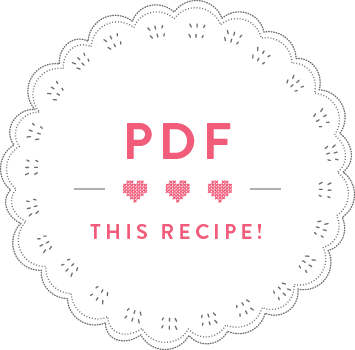 As I’m posting this recipe I am actually on my very first trip through Vietnam. The recipe however, was created a few weeks before my trip, in anticipation to this epic yummy holiday. 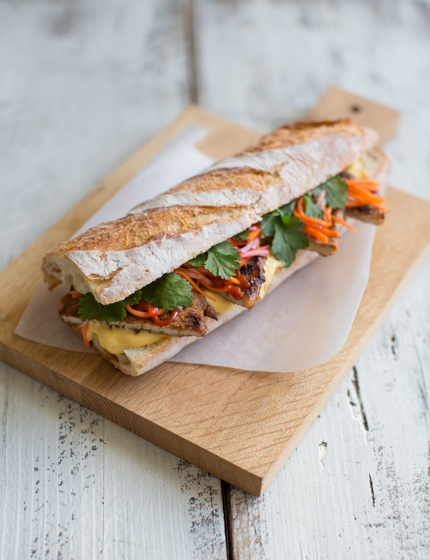 Banh Mi is a Vietnamese sandwich, made with a super light and crispy French baguette. It dates back to the time when Vietnam was a French colony – and so this traditional European bread is filled with Vietnamese flavours. Banh Mi is often made with a mixture of grilled meat and paté, then stuffed with pickles and fresh herbs. I’ve left out the paté for my banh mi, but nothing keeps you from adding a bit to it. Start by making the marinade for the pork: trim the lemongrass stalks and cut into rough chunks. Peel and chop the shallot and garlic cloves. Add these to a food processor together with the sugar, soy sauce, Thai fish sauce and sunflower oil. Cut the pork loin steaks into fine slices of approx. ½ cm and put into a ceramic bowl. Add the marinade to the pork and rub well into the meat. Cover and leave to marinate at room temperature for 1 hour. Meanwhile, prepare the pickles. Peel and grate the carrot, grate the radishes and put all the vegetables into a bowl. In a saucepan, heat the rice wine vinegar, sugar, salt and 80ml water and bring to the boil. Take off the heat and pour onto the grated vegetables. Cover and leave to marinate at room temperature for 1 hour. After 1 hour, heat a griddle pan and grill the pork steaks for 2-3 minutes on each side until cooked through. Leave to rest for 5 minutes. Meanwhile, cut the baguette into two and slice each baguette piece open. Spread some mayonnaise on the bottom slices, top with a few grilled pork fillets, cover with pickles, drizzle with sirarcha sauce and sprinkle some coriander leaves on top.